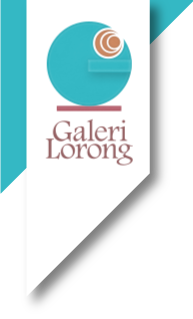 Gallery Lorong is aimed to become a multilayer space which facilitates the artists and the creative world of different disciplines and generations, and seeks to bridge or to connect various forms of artistic and creative works. Lorong not only has the interest to be an art space, but also to be a space that opens a critical interaction about the issues related to art and culture. Specifically, Gallery Lorong works through the perspective of art or craft, both in the exhibition and the study of it. Gallery Lorong positioned craft as an opened text in hope to be explored and to be discussed by any one. Craft is not only shown as merely a medium or the material, but craft is also studied, observed, and re-interpreted. Gallery Lorong attempts to take craft as the core of a wider discourse, considering on both practice and discourse in which still is rarely to be discussed in the world of contemporary art in Indonesia. Gallery Lorong takes craft as a collaboration work. It is not merely an identification toward particular artistic form, or an artwork with particular material, craft is also about the relation among human in the work process itself. In other words, Gallery Lorong always encourages the art practice which is based on the work process and the exploration of issues. Gallery Lorong attempts to avoid any kind of exotization and glorification toward the works of craft. Therefore Gallery Lorong exposes the rooms of critical dialogue and an endless exploration toward the issues of craft. Every year, Gallery Lorong works on its two biggest programs: exhibition and discussion series (Craftmantalk). There are four to five exhibitions which is held annually, specifically in craft as a medium dan form, or any kind of exploration and experimentation done by the artists. Each exhibition will include artists talk, project presentation or artistic work presentation from the artists who are showing their work in the exhibition. As for the Craftmantalk, this discussion series will be held five times. Craftmantalk is an interaction space about various issues regarding to contemporary art in Indonesia, especially Yogyakarta.